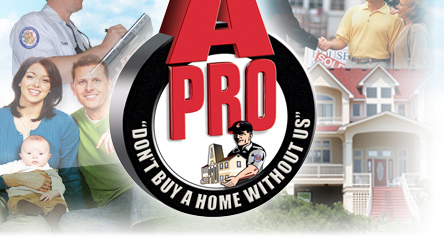 A-Pro Home Inspection Service was established in the New Orleans area in 1994 with a goal to serve the area’s need for affordable, professional home inspection services. Company founder Greg Mangiaracina, co-author of the book “How to Market and Operate a Home Inspection Business,” saw a pressing need in the Home Inspection Industry for a marketing system that better addressed the needs of real estate agents, vendors, and home-buyers frustrated by unexpected repair problems and costs in the home inspection process. A-Pro’s idea was simple: deliver fast, detailed service that customers could rely on with confidence. This philosophy was echoed in the company’s unique warranty statement: “If We Don’t Report It…We Repair it.”™ From this idea rose concepts that revolutionized the home inspection industry, such as the “All-in-One”™ plan which guarantees both the “home inspection” and provides the client with a “no further evaluation” guarantee (most home inspectors find problems then tell you you need to get the house reinspected with another party, e.g. plumber, roofer, etc). The guarantee is free and provides protection for 120-days after inspection. A-Pro also taught’s the most comprehensive and professional reports in the industry, 24-hour/7-day-a-week availability, and other services designed to save customers time, money and aggravation. This entry was posted on Monday, September 2nd, 2013 at 1:09 pm	and is filed under Top Salt Lake City Real Estate Agents. You can follow any responses to this entry through the RSS 2.0 feed. Both comments and pings are currently closed.